Dress the part and lounge around your own curtained-off cabana for the day. Press the proverbial "pause" button and just hang out poolside until you're ready to hit "play" again. Keep dinner simple with family favorites like burgers or steaks on the grill. Stick to your usual workout drill, or switch things up at the onsite fitness center. Need a break from the flashing lights? Borrow a board game or DVD and bust out some surprise snacks you had hidden in the kitchen. 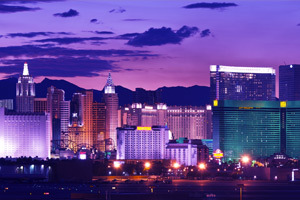 Take in all the attractions on the Strip, it's a 14 minute walk from the resort. Treat yourself to a massage at Wyndham Grand Resort. It's only a 5 minute drive to the Bellagio Fountains - what are you waiting for? You're a 10 minute drive from High Roller - the world's tallest Ferris Wheel. Planet Hollywood is a 14 minute walk from the resort - test your luck. Recover from your day in the jetted tub - available in 2-bedroom units. A few blocks east of the can’t-miss Strip and just west of the Hard Rock Café & Casino, the Mediterranean-style Wyndham Grand Desert makes a great home base. Traditional décor and oodles of onsite amenities affirm your excellent resort-choosing skills. Three heated outdoor pools are calling your name. Spring for a cabana and make a day of it – throw on some oversized sunnies and kick back celeb-style. The activities team keeps things lively with daily games, crafts and contests for both adults and the kid-crowd, so bring your A-game. Recovering from a late night? Find your way to the Starbucks cart until you’re ready to take on the fitness center, then ask about scheduling a massage for later. For low-key evenings in, gather your crew in one of the four outdoor hot tubs or pull up seats around the fire pit and vote for your favorite only-in-Vegas sights. Switch things up with trips to the game room and 3D movie theater. Or just keep working your way down that must-see list. Each spacious one- and two-bedroom condo is equipped with a well-appointed kitchen, complete with blender for frosty after-pool drinks. Stock up on groceries and plan to dine in – you can pick up those few inevitably forgotten items from the onsite MarketPlace. Or make those forgotten items your perfectly legit excuse for dining out – options abound, from celebrity chef burgers to mind-blowing buffets. If you feel like taking a break from the shows and casino scene, you can check out DVDs and board games from the front desk. Pop some popcorn or scoop some ice cream, and if you’re up for it, start making a plan for the next day – a whole lot of once-in-a-lifetime experiences await. Hop the free shuttle to the world-famous Strip, or catch the Fremont Street shuttle and join the crowds for the classic Fremont Street Experience. (See who can count the most Elvis impersonators.) The concierge can guide you through options for dining, sports, concerts, comedy and shows – or help you get a tee time. There are four golf courses within five miles of the resort. If you want to get really crazy, book a Grand Canyon helicopter tour or day trip to Hoover Dam. Already hit the biggies like the Bellagio fountains and Planet Hollywood? Look for something off the beaten path, like the world’s fastest zipline, or golf lessons from the guy who taught Tiger Woods. Pretty much anything is possible in Vegas.